JURA Elektrogeräte Vertriebs-GmbH was founded in Nuremberg in 1987. 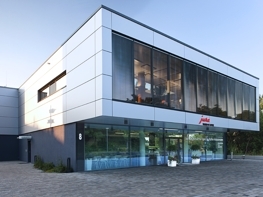 This well-known espresso and coffee machine specialist has been using a DRAABE air humidification system in its customer communications centre since 2012 for the optimum indoor climate. The JURA building was built in 2011/2012 and houses, among other offices, the customer communications centre. Thirty employees are available there for the end clientele and retail distributors 362 days a year, around the clock, in shifts, to advise and support them in all questions pertaining to JURA machines and accessories. Before 2012 the customer communication centre was in the old company building and the indoor climate, with its lower air humidity was not optimal. Excessively dry air is one of the most common reasons for respiratory ailments, which also include hoarseness and inflammations of the throat. But even before serious illness may occur, excessively dry air is often the reason for complaints: Mucous membranes dry out and become irritated. Talking is perceived as uncomfortable and stressful. The voice is no longer as smooth and the most important articulation will become difficult. Respiratory illnesses are one of the most common reasons for sick leave in call centres. The new centre planned a direct room humidification system into their design to counteract respiratory illnesses and voice disorders with this preventive step. It is equipped with specifically designed atomisers for constant optimum humidification and very quiet operation. These DRAABE air humidification systems are certified with the test mark for optimised air humidification by German statutory accident insurance [Deutsche Gesetzlichen Unfallversicherung, DGUV] and also meet the guidelines of the VDI 6022, Sheet 6 for decentralised air humidification systems. JURA was immediately convinced. “Hygiene and safety are of course both especially important for such a system. DRAABE can guarantee the safety we need and the understated design of the atomisers integrate perfectly into the room”, emphasises a convinced Thomas Fechner, representative of the Management Board at JURA Elektrogeräte Vertriebs-GmbH. DRAABE’s semi-annual exchange of the water treatment container and overall check of the system guarantee a trouble-free, hygienic and safe use of the air humidification system. The system is therefore completely maintenance-free for JURA as the user.